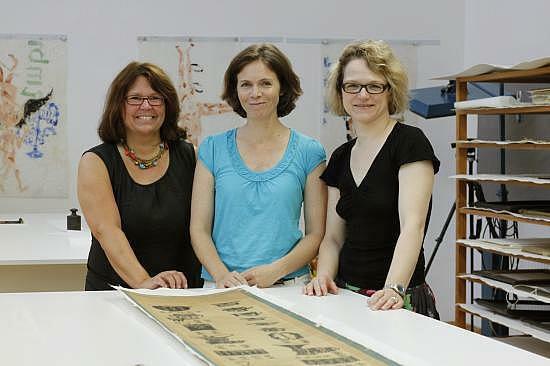 After several years of employment at the centre for restoration in Düsseldorf, Gabriele Emonts-Holley founded the studio for paper- and book con-servation. The facilities were shared with the newly founded studio for the conservation of paintings by Brüning & Schubert. The substantial working space of an old safe factory offered enough space for both labs, which worked on several (at times very large) restorative projects. Katrin Bode joined the studio for paper- and book conservation in 1998, which resulted also in the change of the legal structure to a GbR. The expansion showed that an extension of the working space in the not too distant future might be necessary. Sabine Güttler joined the studio in 2010, which made the permanent work-force grow to three members. At the same time, more working space was on offer located within the wider facilities. Since August 2011 the studio’s home is now at Neanderstrasse 31a, where a complete refurbishment of the new working space has resulted in an area of about 300 m2 for us. This move has enabled us to provide more extensive and more efficient graphic design-, book- and archive- conservative work which adheres to modern standards. VdR (Federation of Conservators) e.V.